On June 13-14, 2017 Microsoft put on an invite-only event for many of our customers. This was scaled back to invite only as a trial and proof of concept. Our attempt was to give a deep technology education to these customers to help them and their employees become Azure Cloud Architects. Target audience was their Architects, Developers and IT professionals that needed to understand what they needed to know to successfully migrate workloads to the cloud. 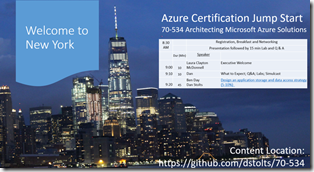 We chose to do this by teaching based on the Microsoft Certification requirements for the 70-534 Architecting Azure Solutions exam. We had an underlying theme of the exam content but we went even further to teach architecting in general, DevOps, micro-services and other important concepts that the Architect needs to know. This event was a resounding success. Continue reading for Labs, slides, video’s and other great content available to you. Content should be made available for others to delver. This is a great way to learn and easy enough to deliver once that the content is created. We made all content available on http://github.com/dstolts/70-534/. We also recorded each session and are making them available right here on the ITProGuru Blog. See links below. See Also the Post Event Report. 7 core modules plus several other topics of interest. Interested in taking the exam? Interested in Signing up for the next event? If you want an event in your area suggest it on meetup. If you are a community group leader and want to run it for your community, contact the leader on meetup. If you are a company that has 50 people or more that would attend, please suggest it on meetup or contact your account management team for a special request. Partial remote attendance is an option.